Blowout Sale! Save 56% on the Paws & Pals Dog Gate Multifunctional Indoor Metal Baby Barrier - Adjustable Tall-Wide Fence for House Doorway with Lockable Pet Door Flap- 53'' Max Extendable by Paws & Pals at Carrie J Keenan. MPN: PTGT-01. Hurry! Limited time offer. Offer valid only while supplies last. 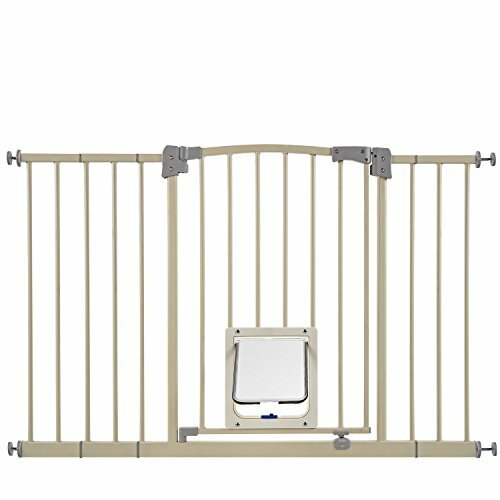 Protect your little loved ones and keep your pet, baby or toddler in their designated area with this Pressure Mounted Metal Pet Gate by Paws & Pals. Protect your little loved ones and keep your pet, baby or toddler in their designated area with this Pressure Mounted Metal Pet Gate by Paws & Pals. It features a swinging door as well as a lockable cat/dog door so you can contain all of your pets and enter/exit with ease. It's super easy to install, requiring no tools, and it's adjustable to fit doorways up to 53 inches in width. You can easily move the indoor fence from one doorway to another, or mount the hardware with the provided screws for a more permanent and secure option. It's made of sturdy, high quality materials and the design will surely compliment any home decor. The surface is incredibly easy to clean (just wipe it down) so you can keep your home and your pet's area looking great with minimal effort. To install, measure the width of your door and add any of the (3) matching grate panels provided if needed. Then, simply place the pet gate in your doorway and turn the Adjustable Wheel Spindles on the Spindle Rods until you get a snug fit against the frame of your door. To open and close your pet gate, rotate the Wheel Spindle next to the gate latch; turn counter clockwise to open the gate and clockwise to close. INCLUDES: One (1) 28" Main Gate Frame, One (1) 4-inch gate extension, One (1) 6-inch gate extension, One (1) 12-inch gate extension, Four (4) Spindle Rods, Four (4) Spindle Wheels, Five (5) wall mounts for frame, Four (4) screws to install the optional wall mounts. SECURE BARRIER: The tension gate will not only keep your pet in in their designated area but you can also use it for children to keep them in a specific room or to prevent them from falling down the stairs. It works great for dogs, cats, rabbits, babies, and toddlers. It also comes equipped with a lockable dog door flap. DURABLE: Constructed with heavy duty metal and utilizing tension wall mounts, this sturdy adjustable doorway gate will securely stay in place. TENSION MOUNTED FRAME: When your package arrives, you will notice a gap between the latch and the side grate- this is not defective- your gate will latch when mounted with the appropriate tension. PLEASE NOTE: When opening your pet gate you have to lift up (to unlatch) and then push out. VIEW THE VIDEO: The indoor gate is super simple to unbox, set up, and install. Just watch the video to the left for a quick tutorial. Safety 1st Wide & Sturdy Sliding Metal Gate, Fits Spaces Between 40" and 64"